I want to begin this week expressing my sadness at the passing of Carolyn Lynch. We join all who knew Carolyn in expressing condolences to her beloved husband, Peter, and her family. Carolyn was a devoted and exemplary wife, mother and friend. Without question, she will be deeply missed. Carolyn Lynch dedicated her life to helping children realize their potential, especially those coming from underprivileged circumstances. Through her passionate commitment to education, Carolyn provided countless young women and men the opportunity to achieve new levels of success. Our world is a better place because of her efforts so generously given on behalf of others. Carolyn was a woman of faith who lived the call to discipleship, witnessing the presence of Christ’s love, care and compassion to all whom she met. With confidence that she is counted among the saints and angels, we pray that she is at peace in the presence of the Lord. Now, on to the events of my week, which has certainly, this has been a very full and very beautiful one. 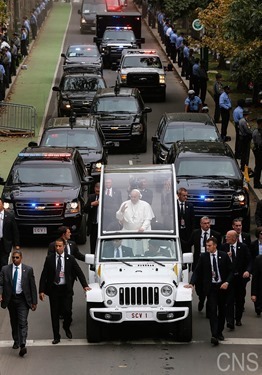 Of course, this week the Holy Father concluded his visit to our country. 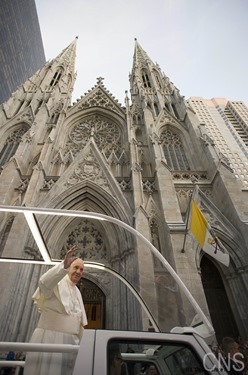 As I concluded the blog last week, the Holy Father had just finished his trip to the site of his first stop in the States, Washington, D.C. From there, as you know, he went on to visit New York City and Philadelphia. 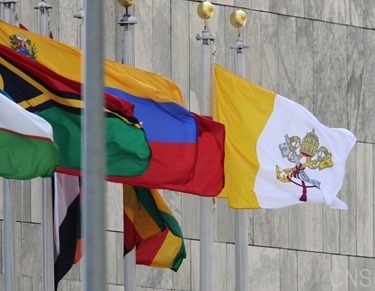 During his trip, the Holy Father made so many important visits and addresses, it would be difficult to recount them all (and I won’t attempt to), but I would like to share with you some of the highlights of this past week. 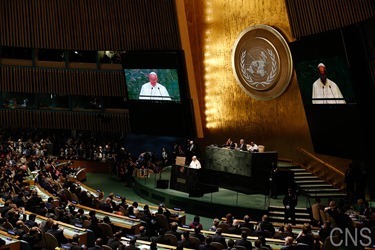 As I mentioned, following his visit to Washington, D.C., the Holy Father made a stop in New York, where he celebrated Mass, visited the 9/11 Memorial and, of course, made his historic address to the United Nations. 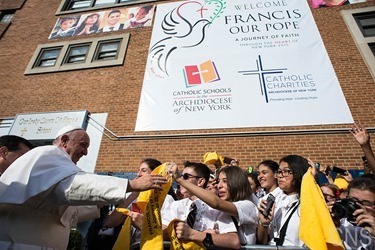 I was also very pleased that during his visit he had an opportunity to visit a local inner-city Catholic school, because throughout the country the Church is struggling to keep these inner-city schools open, yet they have such an important mission. 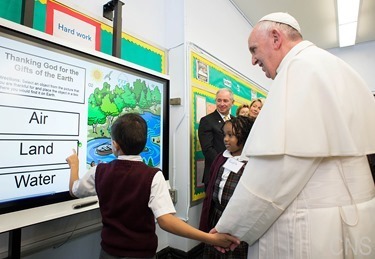 So, I was very pleased to see that Holy Father visited one such school to shine a spotlight on, and lend his support to, this crucial mission of our Church. 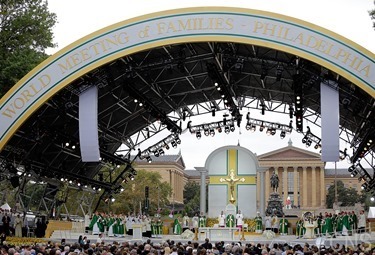 Of course, the reason why the Holy Father made his visit to the United States in the first place was to fulfill a promise that Pope Benedict had made to attend the World Meeting of Families that was held in Philadelphia from September 22 – 25. 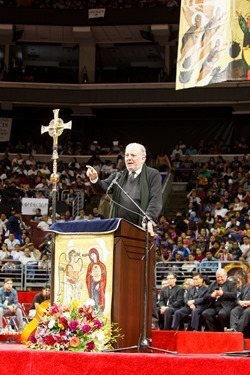 These gatherings are held every three years and this was the first time it has ever been held in the United States. 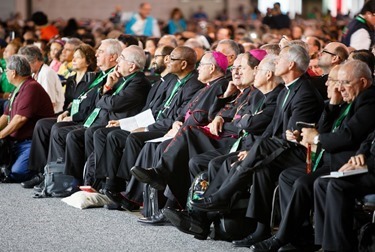 The previous World Meeting was held in Milan, and I was very privileged to be present at that gathering with Pope Benedict. 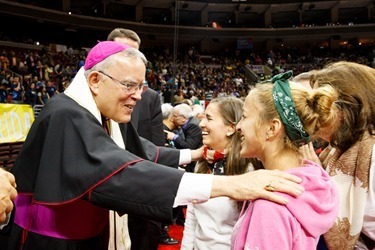 Archbishop Chaput told me that the gathering this year was the largest ever for a World Meeting of Families – I believe 20,000 or so people attended, including quite a number of people from the Archdiocese of Boston such as Father Matt Williams, Father Paul Soper, Father Michael Harrington and Marianne Luthin of our Pro-Life Office. 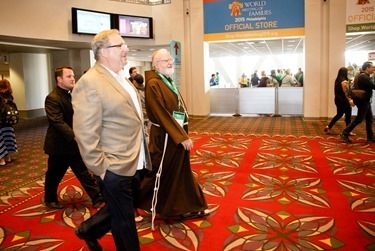 Originally, I was asked to give the opening keynote address of the World Meeting. 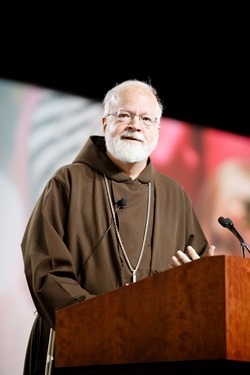 However, because the Holy Father had scheduled a meeting in Washington with the bishops of the United States on that day, Archbishop Chaput reorganized the schedule to allow me to deliver the final keynote. 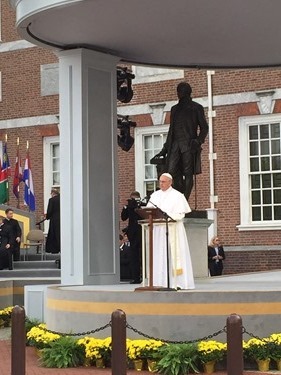 For that reason, I did not accompany the Holy Father to New York, but instead went directly from Washington D.C. to Philadelphia to give my address Friday morning. 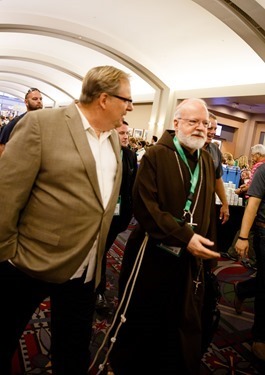 But that change made for a very interesting experience, because it meant that the time for my talk was shared with the larger-than-life figure of Rev. 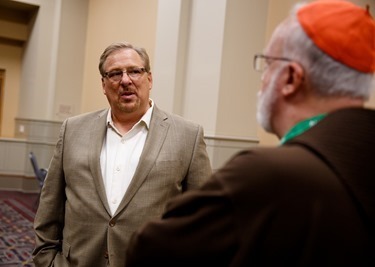 Rick Warren from Saddleback Church in California, who gave a very spirited presentation. 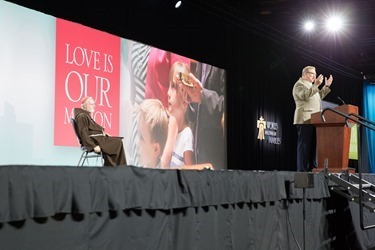 I was very happy to share the stage with him and, as I said in my talk, the fact that we were able to appear together underscored the fact that people of faith need to come together around issues that promote the Gospel of Life and the family in our country. 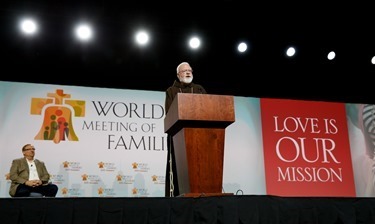 I was very edified to see such a large crowd, including so many young people, participating in the World Meeting of Families. 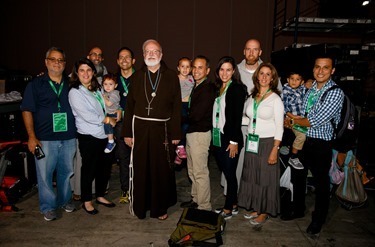 After my talk I had a chance to meet many of the people attending the Family Meeting. 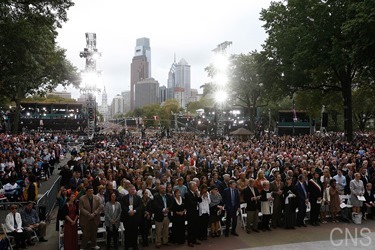 In all, I feel that the world meeting was a great success and a wonderful preface to the Holy Father’s arrival in Philadelphia. 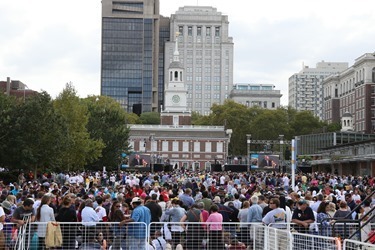 The Holy Father arrived in Philadelphia on Saturday morning and in the afternoon, he made an address the on issue of religious liberty and immigration at Independence Hall, the very site where the Constitution and the Declaration of Independence was signed and near where the Liberty Bell is kept. 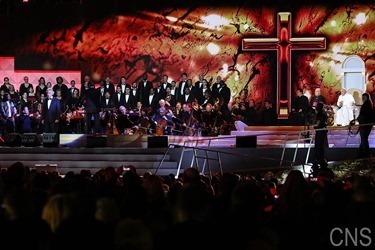 Certainly it is a very iconic site for Americans, particularly around the issue of religious freedom, which is one of the founding principles of our country. 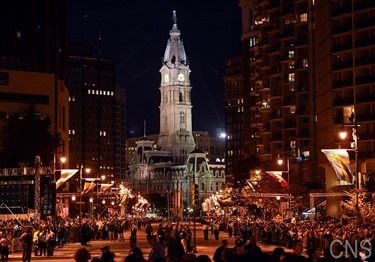 Saturday evening was the Festival Families on the Benjamin Franklin Parkway. 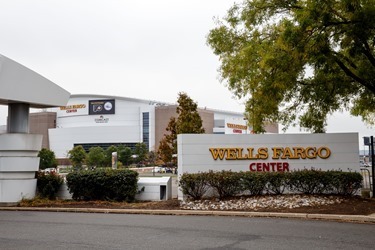 It was a beautiful event and we were blessed by having perfect weather. Mark Wahlberg was the emcee of the evening and there were testimonies from six different families from throughout the world. 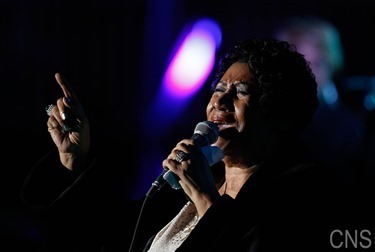 There were also a number of musical acts, including Aretha Franklin, who sang Amazing Grace, and Andrea Bocelli, who sang the Our Father. 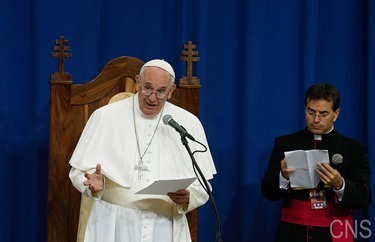 The evening concluded with the Holy Father giving a very spirited, spontaneous talk that was excellent and seemed to be very much appreciated by the people. 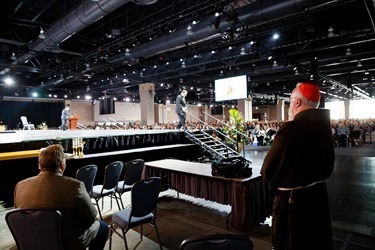 Sunday morning, I was privileged to be present for the meeting the Holy Father held with victims of sexual abuse — some of clergy abuse and others who had been abused in schools or by members of their family. 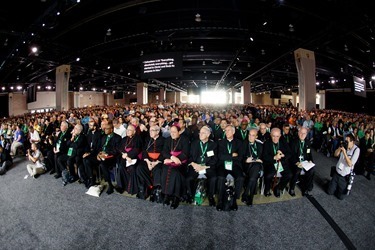 This is something of a departure from what the Holy Father has done the past, where he would normally only meet with victims of clergy abuse. 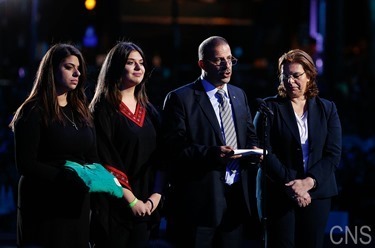 However, but because the encounter came in the context of the World Meeting of Families, it was seen as important that he also meet with those who were abused in other settings. 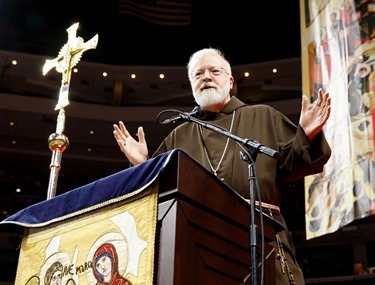 Of course, the Church’s effort to protect children extends to all children and our ministry to all those who have been victims of any kind of abuse. 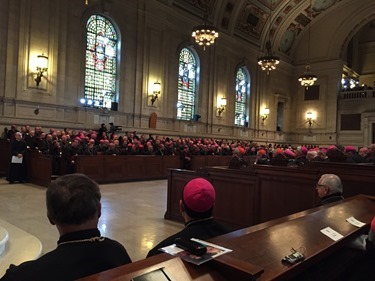 Sunday morning, the Holy Father met with the bishops from all over the world who had gathered for the World Meeting of Families at St. Charles Borromeo Seminary. 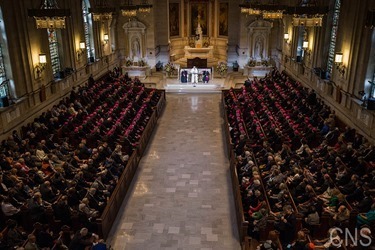 In his address to the bishops, he began by speaking of his meeting with the victims and once again committed the Church to transparency and zero-tolerance of clergy abuse. 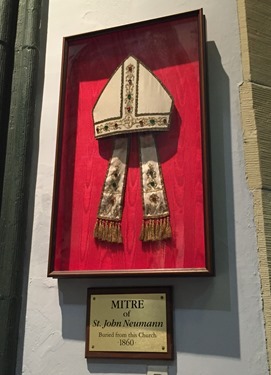 He went on to challenge the bishops to maintain a focus on a life of prayer and of preaching the Gospel. 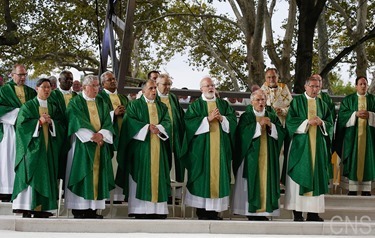 He cited the Acts of the Apostles in which, as he put it, the Apostles “invented” the diaconate under the inspiration of the Holy Spirit in order to be able to free the bishops for prayer and preaching. 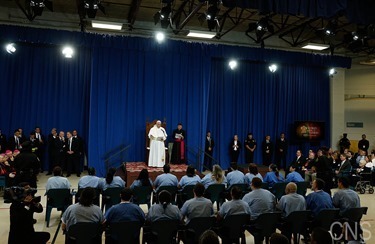 The Holy Father also visited a local prison while he was in Philadelphia. 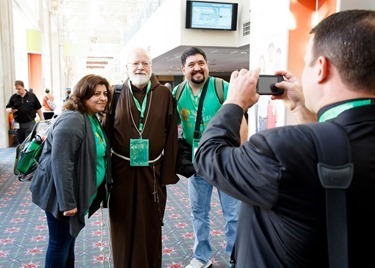 In fact, the chaplain there is one of our Capuchin Friars, Father Matthew. While I haven’t had a chance to talk to him about it yet, by all reports, it was a very beautiful visit. 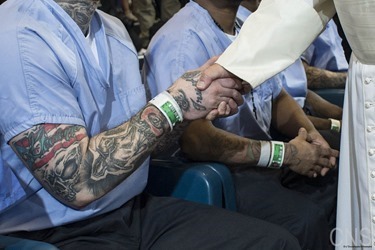 I know the inmates are very moved by the Holy Father’s outreach to them. 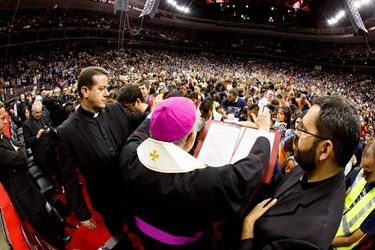 Then, of course on Sunday afternoon was the closing Mass. 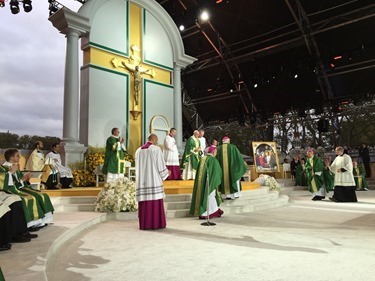 It was held in the same spot as the Festival of Families, but in less than 24 hours they had changed what had been a stage into a splendid altar. The crowd for the event was absolutely huge. 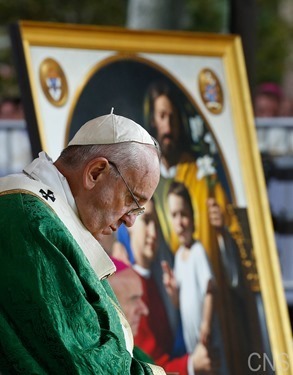 In his homily, the Holy Father delivered a very beautiful message on family life. 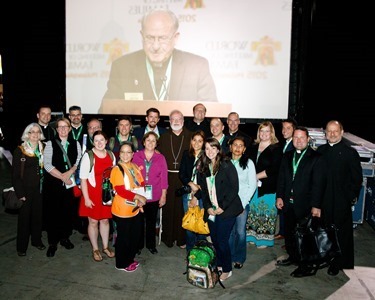 At the close of the Mass, they announced that the next World Meeting of Families will be held in Dublin in 2018. 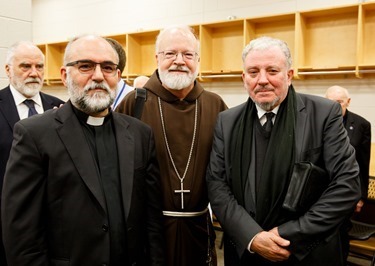 Archbishop Dermot Martin was there for the announcement. 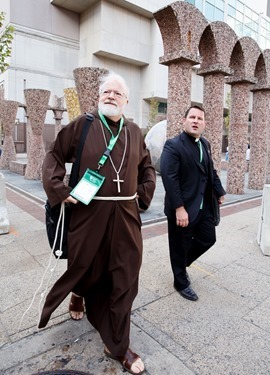 After the Holy Father’s departure in Sunday night, I remained in Philadelphia for an extra day. 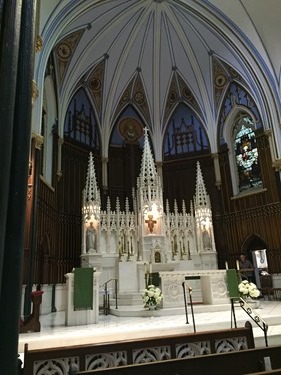 So on Monday morning I visited with the Capuchin Friars at St. John’s Church, the church that had been built by St. John Neumann. 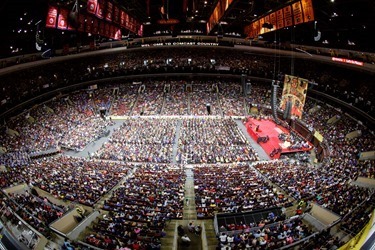 There is a great Catholic history in Philadelphia and they have a tradition of saints who have come from there, including St. Katharine Drexel and Bishop Neumann. 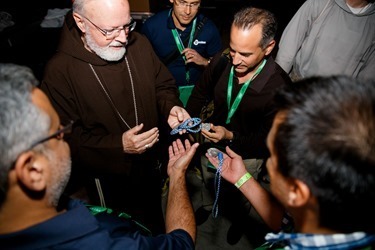 The Capuchin Friars very enthusiastically spoke to me of having the relics of St. Maria Goretti in the parish, and how throngs of people had come to venerate them. 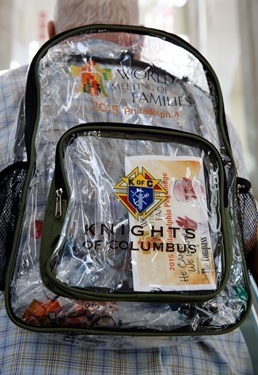 Here in Boston are looking forward to having these same relics of St. Maria Goretti visit our own Cathedral on Monday, Oct. 5. 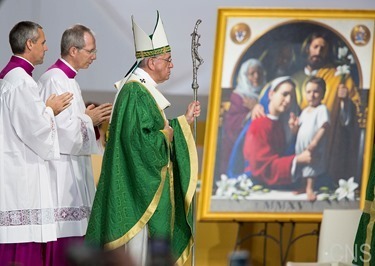 There will be masses celebrated that day on 9 a.m. and 7 p.m. followed by veneration. Also that day, I had a chance to meet with Lisa and Juliet, two sisters whom I have known since my time in Washington and who now live in Philadelphia. Their parents were very involved with Cursillo and I presided at their marriage and baptized and confirmed their children. It was wonderful to see them again. 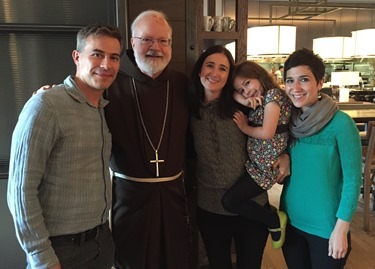 Monday afternoon, there was a gathering of families from the Neocatechumenal Way with the initiators of the Way, Kiko Argüello and Father Mario Pezzi, and several cardinals and bishops, including myself. 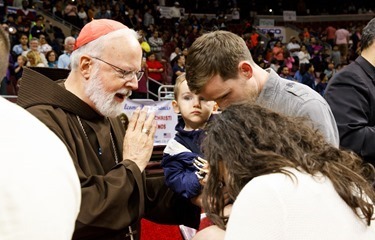 During these gatherings, there is often what we call an “altar call” for vocations but, in addition to that, at this meeting there was an altar call of families who were willing to be missionary families. 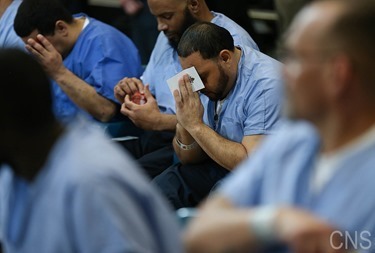 It was just very moving to see the hundreds of families that came forward, willing to serve the Church. 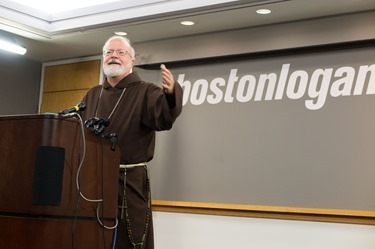 Tuesday, upon returning from Philadelphia, I held a press conference for members of the Boston media at Logan airport. 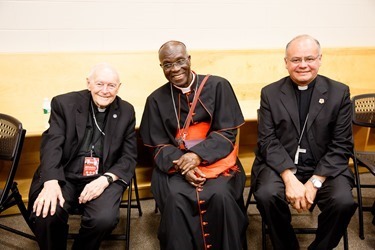 I was happy to be able to share with them some of my reflections on the events of the past week. 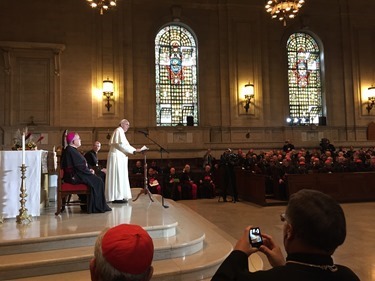 In my remarks, I said the Holy Father’s visit was like a national retreat for the entire country, because during this time we turned away from all the things that typically occupy our attention to hear a message about God, the transcendent, the values of the Gospel. It also was a message that called us to be better people and individuals. 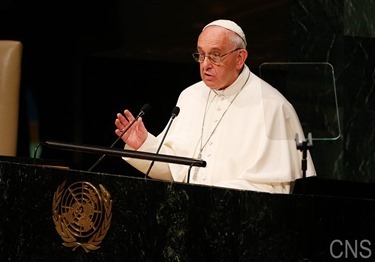 The Holy Father called on us to take care of the planet and each other, and to look for paths of reconciliation to build the world that is more just, fraternal and according to God’s plan.